On the back of the Topol Review, why not get involved with the Genomics Conversation, being led by Health Education England. 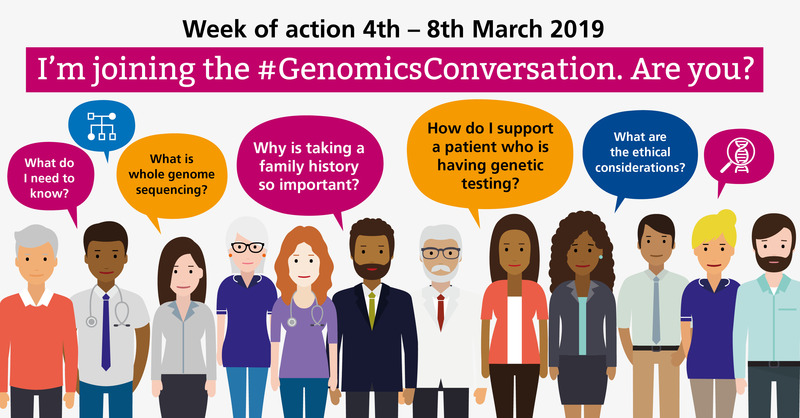 Join our second #GenomicsConversation week of action on 4th March 2019 to learn more about genomics in healthcare. The goal for the week is to spark a conversation among all health professionals and increase familiarity with the word ‘genomics’ so they feel more comfortable discussing genomic testing with their patients as well as signposting to relevant information and services. Throughout the week there will be various free activities available, including a panel event in Birmingham and the launch of new podcasts, online courses and educational resources. Each will be designed to raise awareness of the impact of genomics on patient care. A full calendar of events will shortly be available via the GEP website and we will provide regular updates via social media. New to the #GenomicsConversation for 2019 is an evening panel discussion event ‘Talking Genomics with Patients’, taking place on Tuesday 5th March in Birmingham. We have joined forces with Progress Educational Trust to create an event that will provide health professionals with useful insights into how best to communicate genomics / genetic information. Attendance is free, but advance booking is required. Book your place now by emailing sstarr@progress.org.uk.